Who doesn’t want total control when it comes to hair styling, especially when you want gorgeous-looking curls that hold up longer than most? With the Marcel curling iron, you are in total control of the kind of curls you want for your look like page boys, waves, spirals, and flips. This is because your fingers rotate the curling iron to create and hold curls which hold longer without creases or friz lines. That is the kind of curl done professionally in salons by trained and skilled hairstylists. The difference between Marcel irons and other commercial curling irons is the fact that it isn’t spring loaded. This means it needs the user to open as well as close it like a pair of scissors. It has a mechanism to lock or unlock for holding the hair being styled or curled in place. This is also what makes this curling iron the preferred choice of professional hairstylists. Based on the Marcel principle for curling ions, the handle of this particular Hot Tools marcel curling iron model was designed specifically to rotate for more flexibility when styling or curling. You, on the other hand, can unlock or lock this handle to set the curl you want to have without having to be a hairstylist or hairdresser. This particular Marcel model is also obviously very good looking (that’s its French origin speaking) as far as curling irons go. Take a look at the features that go with it. The Hot Tools 1182 – Now Available at Amazon! On and off switches are separate to help the rheostat mechanism memorize preferred heat settings. With adjustable temperature range between 280°F and 430°F. With a foldaway safety stand to prevent scorching of tables or countertops when in use. Barrel has 24K gold plating. Marcel handle locks and rotates. Gets Hot… Stays Hot™ quality of performance. Eight foot swivel cord is heavy duty and tangle-proof. Textured handle is Soft-Grip™ for more secure and comfortable handling. Safe locking and unlocking with TouchGuard™ feature in its Marcel handle. Rheostat control is built in this Marcel iron curler to maintain consistent temperature throughout curling time. Heating element is heavy duty and long lasting. Technology: Pulse Technology® is patented. Dimensions: 12.1 inches by 1.6 inches by 3.8 inches. Warranty: Limited to one (1) year. Marcel curling irons have remarkable heating properties that get your hair curled faster in a shorter amount of time. This, of course, means that your hair shaft and cuticles don’t undergo excessive and prolonged exposure to high heat temperatures each time you curl or style your hair. Simply put, reduced curling time translates to less risk of hair damage. The professional quality of this Marcel iron makes nonstop, quality, and consistent curling conveniently possible. The Hot Tools 1182 curls and styles your hair at the same time which is a real time saver if you’re on a tight schedule. The ironwork is, of course, durable and heavy duty, and the 24K gold plating gives it so much more class not normally found in curling irons. Its patented Pulse Technology® senses the loss of heat and speedily regenerates it, another factor to consider if you want your curls to hold longer and remain in perfect shape. According to those who have purchased and used the Hot Tools 1182 Iron, its main con is that of knowing how to operate it to obtain the best results. Most buyers of this particular Hot Tools Marcel curling iron reported the high risk of getting burned if you’re not adept in its use once the temperature rises and the curling iron gets hot. 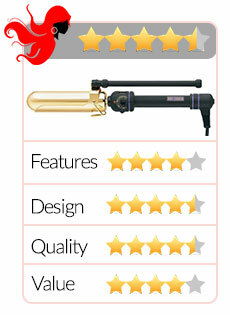 Still, this is the only drawback that this particular Marcel curling iron has based on customer reviews and even then, customers have suggested watching tutorial videos – notably the one of renowned hairstylist Johnny Lavoy with some Ford models (see below) – to get the hang of using a professional tool like the Hot Tools 1182. Out of 177 customer reviews, 108 gave the thumbs up to the Hot Tools 1182 and gave it an Amazon rating of between 4.5 and 5 stars. That’s definitely a plus for this particular Hot Tools Marcel curling iron, considering the overwhelming plethora of curling irons available on the market today. If your hair is hard to curl or prone to damage from excessive heat, this particular Marcel model is perfect for you with its rheostat control feature. If you don’t mind practicing how to operate a curling tool, then by all means, get this particular Marcel curling tool. You obviously need to become fairly familiar with how the lock and unlock mechanism works as well as how to make that quick release of your hair before heat is applied to it. Other than this basic safety measure, which you can perfect by watching the extremely helpful video tutorials as mentioned, getting the Hot Tools 1182 Curling Iron is a long term investment which you should seriously consider; after all, it isn’t everyday that heads turn to look at your spiffy and eye-catching curls. This curling iron, named after the French hairdresser François Marcel in the 19th century, revolutionized hairstyling all over the world and has remained a classic curling process, originally called the Undulation Marcel but has since evolved to be known as the Marcel Wave. Although the hairstyling and curling techniques have evolved, the Marcel curling iron is very much in vogue. And if you want professional salon quality curls for the fraction of the cost, get this Hot Tools professional Marcel curling iron and see the difference between creating curls with regular curling irons and one that bears the Marcel brand. 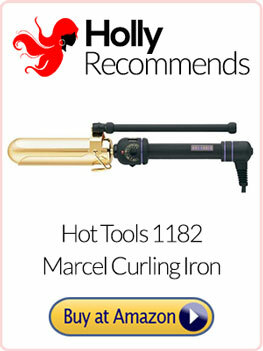 Click Here to Get the Hot Tools 1182 Marcel Curling Iron at a Great Price From Amazon!